The above chart is from our April newsletter on Microsoft Exchange 2010 Solution Reviewed Program (ESRP) results for the 1,000 (actually 1001) to 5,000 mailbox category. We have taken the database transfers per second, normalized them for the number of disk spindles used in the run and plotted the top 10 in the chart above. A couple of caveats first, we chart disk-only systems in this and similar charts on disk spindle performance. Although, it probably doesn’t matter as much at this mid-range level, for other categories SSD or Flash Cache can be used to support much higher performance on a per spindle performance measure like the above. 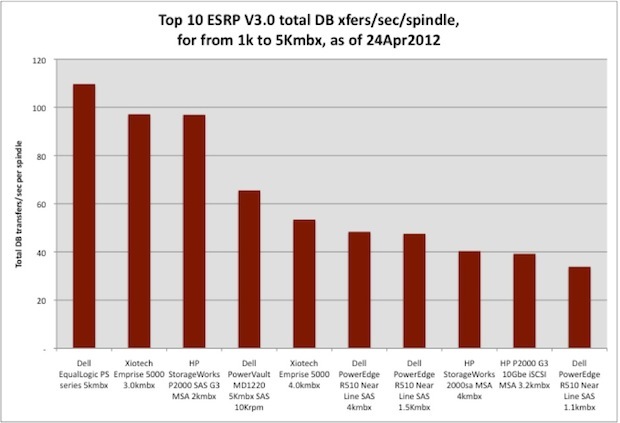 As such, submissions with SSDs or flash cache are strictly eliminated from these spindle level performance analysis. Another caveat, specific to this chart is that ESRP database transaction rates are somewhat driven by Jetstress parameters (specifically simulated IO rate) used during the run. For this mid-level category, this parameter can range from a low of 0.10 to a high of 0.60 simulated IO operations per second with a median of ~0.19. But what I find very interesting is that in the plot above we have both the lowest rate (0.10 in #6, Dell PowerEdge R510 1.5Kmbox) and the highest (0.60 for #9, HP P2000 G3 10GbE iSCSI MSA 3.2Kmbx). So that doesn’t seem to matter much on this per spindle metric. That being said, I always find it interesting that the database transactions per second per disk spindle varies so widely in ESRP results. To me this says that storage subsystem technology, firmware and other characteristics can still make a significant difference in storage performance, at least in Exchange 2010 solutions. Often we see spindle count and storage performance as highly correlated. This is definitely not the fact for mid-range ESRP (although that’s a different chart than the one above). Next, we see disk speed (RPM) can have a high impact on storage performance especially for OLTP type workloads that look somewhat like Exchange. However, in the above chart the middle 4 and last one (#4-7 & 10) used 10Krpm (#4,5) or slower disks. It’s clear that disk speed doesn’t seem to impact Exchange database transactions per second per spindle either. Thus, I am left with my original thesis that storage subsystem design and functionality can make a big difference in storage performance, especially for ESRP in this mid-level category. The range in the top 10 contenders spanning from ~35 (Dell PowerEdge R510) to ~110 (Dell EqualLogic PS Server) speaks volumes on this issue or a multiple of over 3X from top to bottom performance on this measure. In fact, the overall range (not shown in the chart above spans from ~3 to ~110 which is a factor of almost 37 times from worst to best performer. The full ESRP 1K-5Kmailbox performance report went out in SCI’s April newsletter. But a copy of the full report will be posted on our dispatches page sometime next month (if all goes well). However, you can get the full SPC performance analysis now and subscribe to future free newsletters by just sending us an email or using the signup form above right. For a more extensive discussion of current SAN or block storage performance covering SPC-1 (top 30), SPC-2 (top 30) and all three levels of ESRP (top 20) results please see SCI’s SAN Storage Buying Guide available on our website. As always, we welcome any suggestions or comments on how to improve our analysis of ESRP results or any of our other storage performance analyses.